Clearwater Beach truly lives up to its name with its velvety sand and placid waters, interrupted only by the occasional wild dolphin or boat passing by. The area’s casual vibe fosters the perfect laid-back getaway you have been looking for. 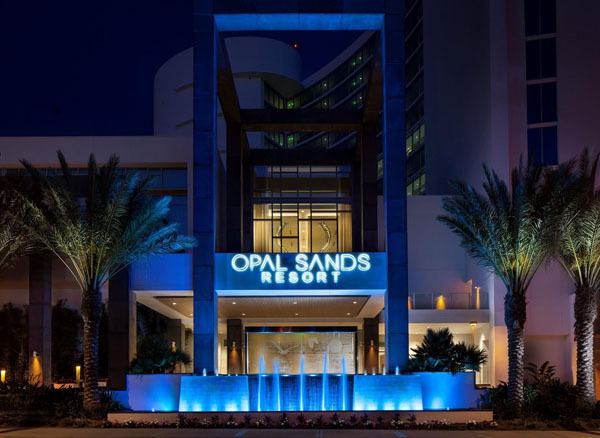 Opal Sands Resort provides visitors with a contemporary Clearwater Beach retreat experience, complete with stunning views of the Gulf of Mexico’s azure waters. Upon arrival, guests will revel in the resort’s panoramic water views and a fresh, modern design that reflects the resort’s beach-chic atmosphere. With 230 Gulf-front rooms and suites to choose from, Opal Sands never falls short of excellence. Every room delivers unobstructed views of the Gulf of Mexico and the decor is an equally blended match of stye and sophistication, which complements the backdrop seamlessly. Coastal-inspired palates and artwork from Christopher Still are by a host of generous amenities from flat screen televisions and deluxe bedding to spa-style bathrooms and floor to ceiling windows to truly take advantage of the stunning views. Vacationers seeking a pampered stay on Clearwater Beach will find comfort at this cozy haven offering lounges by the zero-entry pool and handcrafted tropical beverages, perfect for sipping on poolside. The spot is known for dolphin sightings, which in itself is a marvel. Partake in a number of resort activities from bike rentals, to beach sport rentals, including: jet skis, paddle boards and kayaks. 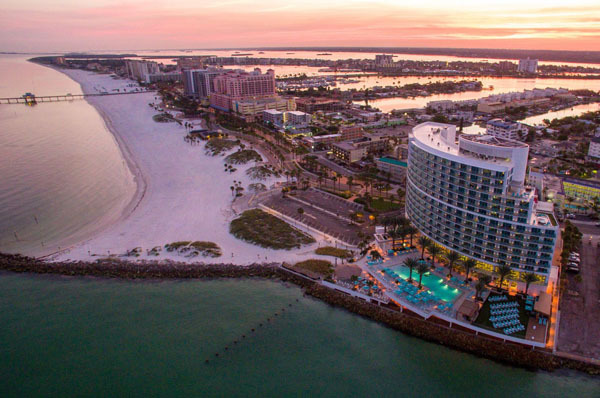 Along with the serene setting on Clearwater Beach, Opal Sands Resort is the ideal home base for taking advantage of the endless activities, attractions and adventures synonymous with Florida’s Gulf Coast. Visitors can check out the nearby Clearwater Marine Aquarium where the famous dolphins Winter and Hope from Dolphin Tale reside. Pier 60 and area attractions are walking distance from the resort, making Clearwater Beach the perfect family-friendly destination for fishing, restaurants, shopping, and nightly sunsets. A daily celebration features arts and crafts vendors, street musicians and entertainers which turn the pier into a display of whimsical motion. The Clearwater Marina offers everything from sunset sails and dinner cruises to deep sea fishing expeditions and dolphin encounters, accommodating everyone’s preferences. Caladesi Island is a must see for guests seeking an outdoor adventure. Enjoy kayaking through the mangroves, sunbathing on the white sand beach, fishing, hiking and spotting wildlife. Beyond Clearwater Beach is an array of family activities in nearby Tampa, St. Petersburg and Orlando like Captain Bligh’s Landing Miniature Golf, Lowry Park Zoo, Florida Aquarium, Dali Museum, and Disney World in Orlando. From annual festivals to spring training, there’s always something going on at Clearwater Beach. The Sugar Sand Festival features a master sand sculpting competition which draws in a large crowd to observe the talented sculptors creating sights we could only wish too create. The events are based on season and the concierge will recommend events happening nearby to ensure you don’t miss a thing. As for dining, Opal Sands Resort is home to three exceptional Clearwater restaurants and bars, each showcasing fresh, locally sourced cuisine, colorful cocktails and unmatched views of the Gulf of Mexico. Revel in a truly unique dining experience at Sea-Guini, boasting local seafood, Italian hand-made pastas and Neapolitan pizzas that take center stage. While the open design ensures spectacular water views from every seat, the additional outdoor terrace allows guests to fully indulge in the vistas and warm, tropical breezes of the Gulf. The Sea-Guini lounge offers elegance in an upscale setting with both indoor and outdoor patio seating with a selection of post-dinner drinks and diverse menu, including pizza and primo options. For a casual Florida experience, the Sand Bar is a splendid beachfront tiki option for cool cocktails, great food, lively conversation and breathtaking views. 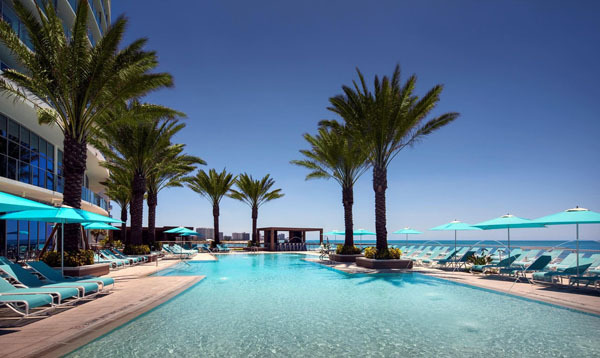 The zero-entry, Gulf-front pool is the perfect place to spend sunny afternoons overlooking the water. The pool bar, Reflections, offers everything you need including appetizers, sandwiches, salads, desserts and of course crafty cocktails for another day in paradise.